Our health is the most important thing that we need to look after. That sounds simple enough. Although, when it comes to healthy teeth, it is our diet that is the most important factor in determining our dental health. Eating is something that all of us do regularly, several times a day. Hence, it only means that we need to look carefully at what we are eating in order to maintain healthy teeth and gums. But wait … is it really so? What is it that we should know? Calcium is the most important mineral for building and maintaining healthy teeth. Isn’t that taught to us in school? Sure, it is. Then, isn’t it strange that we have a short memory when it comes to having foods that supply mineral calcium to the body to maintain healthy teeth and bones? Calcium is plentiful in foods like cheese, milk, plain yogurt, calcium-fortified tofu, leafy greens and almonds. Fortunately, all these products are available in a number of variants, flavours, packaging sizes and hence, all are easily and plentifully available at the nearest grocery or supermarket. Along with calcium, the other mineral that is good for our teeth is phosphorus. Protein-rich foods like meat, poultry, fish, milk and eggs are the best sources of phosphorus. Both calcium and phosphorus play a critical role in dental health, by protecting and rebuilding tooth enamel. Fruits and vegetables are high in water and fiber, which balance the sugars they contain and help to clean the teeth. These foods also help stimulate saliva production, which washes harmful acids and food particles away from teeth and helps neutralize acid, protecting teeth from decay. Plus, many contain vitamin C (important for healthy gums and quick healing of wounds). This doesn’t mean that one does not brush and floss. It just adds to the health of our teeth and improves their longevity. Do you have a “sweet tooth”? Sweets, lollies, chocolates, candies, cola drinks and beverages… the list is endless. They all come in attractive colours, packaging and have always been around to lift up our spirits when we wish to celebrate or just “feel good”. But isn’t sugar bad for teeth? Research has shown that too much sugar is bad for health in general and for teeth in particular. Not only does high sugar consumption play a contributing role in developing diseases such as diabetes and obesity, it is the main cause of tooth decay (cavities). To get an idea about the sugar that is present in some of the foods we like to have, look at the list below. If the choices are now clear, stick to safety. Avoid snacks like chips, pastries, confectionery, colas, etc that only add empty calories and give your teeth a “sugar bath”. Stick to healthy food like fresh fruit. Avoid eating processed foods. That way, you can be certain that plaque producing acids will not harm your teeth and you will have healthy and strong teeth. 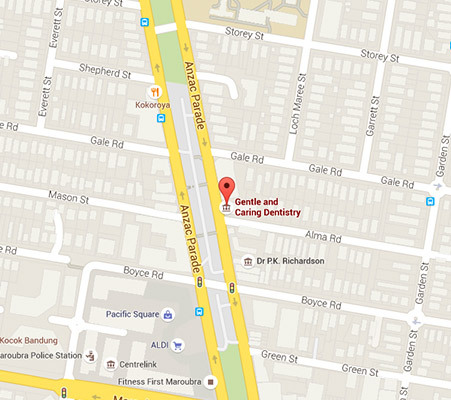 Call your dentist in Maroubra for a regular checkup or to discuss and dental issues.